I'm still struggling to get back in the groove here. Honestly chatting with the children has not been happening a whole lot lately. With all the schedule upheaval at my house, anything beyond the necessities tends to get pushed aside and, when we do have interesting exchanges, I forget to type them up. Hopefully soon, I'll have more of substance. In the meantime, something did happen last week which always fills me with angst. Report cards were issued. Both girls did extremely well. This is great and problematic at the same time. All of Grace's grades were 95% and northward. They don't give grades proper in first grade, so as best as I can understand the convoluted rating system, Olivia had equivalent scores. The girls, Grace especially, are very conscientious about their work, but honestly we don't work very hard or very much with them on their schoolwork. They achieve these grades mostly on their own. I know that home environment contributes to success in school so I am not discounting our input into the equation. I am only noting that when it comes to the actual work itself, we do not have much to do with it. This situation can only mean one thing: school is too easy. They aren't being challenged at all. I am not one who thinks school needs to be at the most challenging level all the time. I think children need room to be children: to play and observe and not constantly driven to achieve. But what about the opposite? When school is never challenging? I don't think this is healthy either. It may look fine now, but habits and expectations are being laid down. The expectation of easy learning is the one I worry about the most. How long do we have to wait before we hit the challenge and what will their reactions be? If the first challenge comes years and years into schooling, the reaction is often not good. An intellectual laziness many times takes hold. The expectation is that learning should always be easy and when it is not, there can be denial and refusal to work through the problem. The other major concern is boredom. For now at their age, the girls are relatively content going to school and getting along, but at some point they will not like having to constantly wait for everyone else to catch up. Preteens are not universally known for their selflessness and Grace is fast approaching that age. Boredom in school is met with resentment: at school, at the busywork, at the teachers, at the parents. There is a restlessness that comes when nothing is ever challenging. Restlessness that can lead to acting out and arrogantly ignoring the learning you need to do on the presumption you already know it. While I am proud of their work and achievements, they also fill me with dread because I know what is likely coming. I wish I had more control over their schooling, but for now, I don't. So I watch and wait and hope. Presents knowledge and ideas in detail verbally, written, and with visuals. The teacher circled the word verbal to give her a separate grade. For written and visual details, Olivia got the highest grade she can get, 4, but for verbal detail, she received a three. Now I promise that Olivia can give just as good detail verbally as she can writing and visually, but she is an introvert. She is never going to talk the ear off an authority figure. She is not going to do it. So essentially Olivia was docked for being an introvert. Poor O. I am sure from the teacher's perspective she gave the appropriate grade because I am sure that Olivia did not meet the standard for a four. Not because she can't, but because she won't. The one interesting conversation I remember from the week was about van Gogh. Grace was studying him in art class and we had a lively conversation about the ear chopping incident and whether or not the poster I own is of "The Starry Night" or "Starry Night Over The Rhone." For the record, it is "Starry Night Over The Rhone" but Grace disagrees. Oh I know what you mean about challenges. Any chance talking to the teacher would be met with a positive response? It's possible the teacher is looking for precisely that input and would love to help you to make school more of a challenge. Maybe? Oh I love that poster. I think I like it better than Starry Night, which Anthony has a little framed poster of. I should get in touch with the teacher. This is the reason I was so frustrated the other day with the botched conference scheduling because this is what I was going to talk about. Of course, I am cynical and I don't expect things to change much whether I talk to the teacher or not. That's my own school experience speaking. Teachers are not concerned about a nice kid with good grades who doesn't act out in class. They just aren't. The fact that said child is bored is disappointing, of course, but when there are so many other bigger problems, that tiny one usually doesn't garner much attention. When I was in school, the standard response from the teachers was more busywork which just encouraged me to keep my mouth shut already. 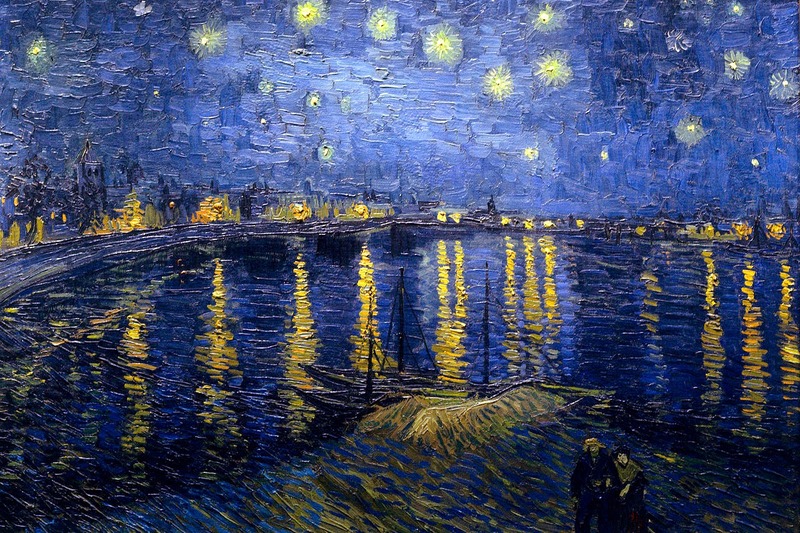 I like Starry Night Over The Rhone a lot better than Starry Night. I love the two people at the bottom. The reason Grace and I were disagreeing is because she remembers seeing the poster, but right now it is in some closet somewhere and we couldn't look at it directly.